Rockstar have very kindly sent us over this new GTAV screenshot exclusively for The GTA Place. 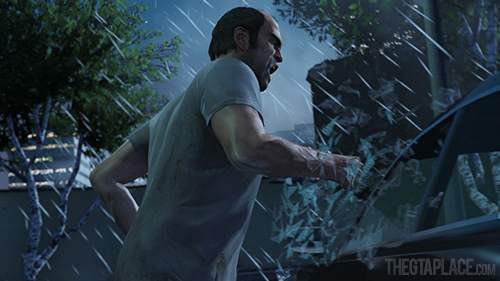 It's Trevor having a fight with a car window! Cheers R*! We hope you're ready as there's just a little more than one week to go until the launch of GTAV. As a token of our appreciation for all the great work you do with your site, here is an exclusive screenshot for The GTA Place. Took a look at the other screenshots and just looking at them makes me wish these last 7 days would go by quicker. Me, my mate and brother-in-law cancelled our pre-orders. We're all going to our local GAME store about 2 hours before midnight to be the first ones to get the game! What's the point in cancelling your pre-order, then? You're getting the game either way, right? Did you pre-order with Amazon or something? No he means he pre-ordered online, for delivery, as opposed to reserving it in-store for pick-up himself. He has cancelled his delivery pre-order because he doesn't believe it will arrive on release day and is instead going to a midnight launch. Because I read an article which I posted a topic about here I'm no longer convinced that I'll get the game on release day and that it may arrive 2 days later. Plus my brother-in-law and my mate are already going to the GAME midnight release anyway, and I'll be in their area on the 16th so I may as well go with them and get it.